In order to achieve the main 4 outputs, following 4 components are implemented under the Project. The “Component A: Rural Infrastructure Development” and “Component B: Associated Initiatives” are field-based activities to improve productivity, which are supported by enhanced project management system through “Component C: Institutional Capacity Building” and “Component D: Project Implementation and Management”. 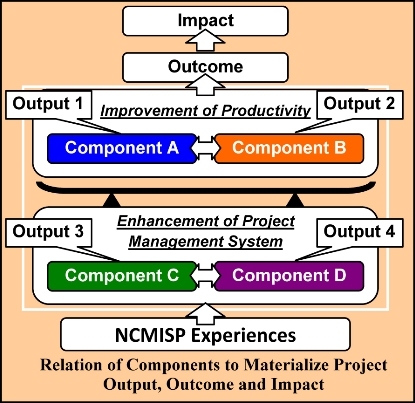 The project framework is shown in the right figure. 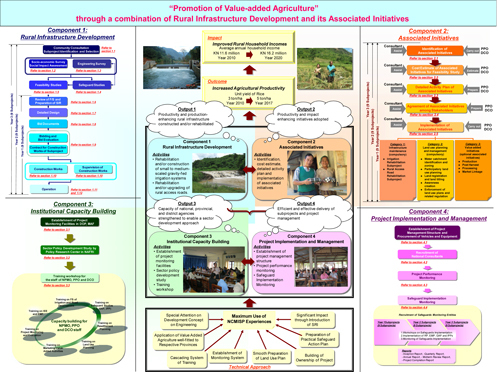 The detailed project framework is presented in the next page with the project concept of “a promotion of value added agriculture through a combination of rural infrastructure development and its associated initiatives”. The Project Design and Monitoring Framework indicating the performance targets at each stage are presented in the next page.